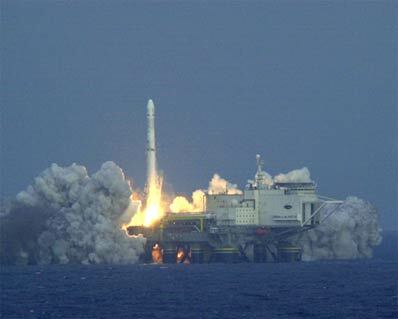 With its popularity growing and new subscribers steadily signing up, XM Satellite Radio successfully deployed its third broadcasting spacecraft Monday night using a sea-launched rocket from a platform floating in equatorial waters of the Pacific. The 20-story Zenit 3SL rocket roared skyward at 0351 GMT (10:51 p.m. EST) after nearly two weeks of delays prompted by bad weather, rough seas and technical issues with the booster. "The launch was awesome. No matter how many times you see one, you always love to see it," Derek de Bastos, XM's vice president for engineering, said from the launch control ship. "It was a good sight to see after all of this hard work. And it was pretty loud, but I'm not sure if that was the rocket I was hearing or my own heart pounding in my head." The two Ukrainian-made lower stages performed their firings to propel the Russian Block DM-SL upper stage and XM 3 satellite out of the atmosphere during the initial minutes of flight. The upper stage's main engine took over, completing a pair of firings separated by a half-hour coast to reach an elliptical geosynchronous transfer orbit stretching from 1,534 miles at its closest point to Earth to 22,241 miles at its highest point. While flying above the coast of Gabon, Africa, explosive bolts holding the 10,350-pound satellite to the spent rocket motor were detonated, allowing small springs to release XM 3. By design, tip-off rates were imparted on the satellite to create a gentle tumble as it moved away at one-foot-per-second. In the coming days, the spacecraft will maneuver itself into geostationary orbit 22,300 miles above the equator where it can match Earth's rotation and appear parked above 85 degrees West longitude. 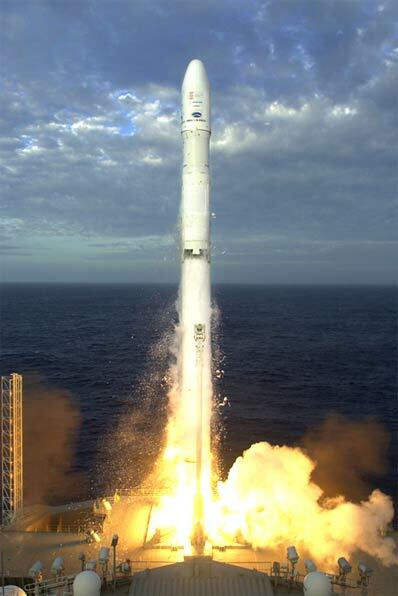 The XM 3 spacecraft is a revised model from its two predecessors, which were deployed in 2001 before engineers discovered a crippling design flaw that degrades the power-generating capacity as the satellites age. The manufacturer -- Boeing Satellite Systems -- removed the faulty hardware and lengthened XM 3's twin solar arrays to overcome the power problem. The satellites cover the entire lower 48 states, beaming programming to special receiving radios installed in subscribers' cars and portable units that you can take anywhere. The system broadcasts digital programming to subscribers from coast to coast, including 67 commercial-free music channels, more than 60 channels of sports, talk, comedy, children's and entertainment programming, and 21 channels of traffic and weather information for select metropolitan areas. More than 3.2 million subscribers listen to XM, which debuted in November 2001, making it the leading satellite radio service in the U.S.
"XM's growth to date demonstrates that the potential for satellite radio is far greater than anyone anticipated," said Hugh Panero, XM's president and CEO. Earlier Monday, the company announced a rate hike, increasing the monthly fee from $9.99 to $12.95 beginning April 2. "This new pricing approach will help fund future technology development, enable us to offer more attractively-priced radios and maintain our programming excellence. Together, these initiatives should result in XM exceeding its current target of 20 million customers by 2010," Panero said. Monday's mission was the 15th for Sea Launch dating to 1999 and the first since being sidelined by a problem with the Block DM-SL last summer. The Odyssey launch platform and the Sea Launch Commander control ship departed home port in Long Beach, California, in early February for the voyage to the equator. "After the first day or so you forget about being on a boat. It just becomes work without the commute," de Bastos said. "We work most of the time but every once in a while we had the chance to do some fishing. We caught maybe 30 or 40 fish before we stopped counting." The vessels will head home to receive the next payload. Sea Launch says it intends to conduct six launches this year.